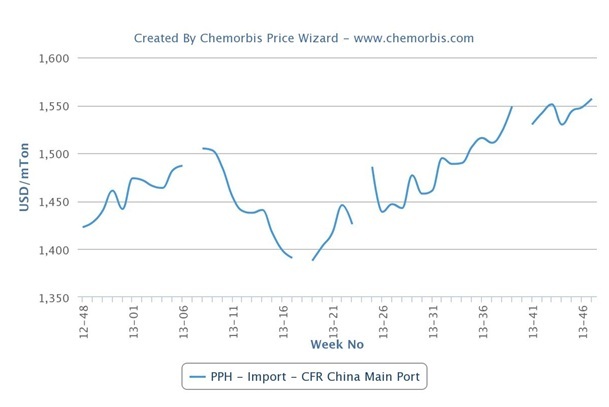 China’s PP prices continued to move higher this week both in the local and import markets, sustaining 5 months of a steadily rising trend. 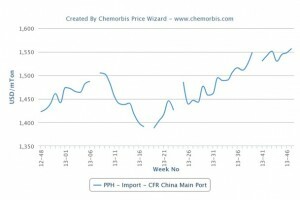 According to ChemOrbis Price Index, the overall firming trend started as early as May despite a few set-backs before the Dragon Boat Festival in June. The recent firming trend has been mainly fueled by supply concerns since the week-long holiday in early October. Two South Korean producers also applied increases ranging from $10/ton to $30/ton for their copolymer offers, although they admitted facing some resistance to their new higher levels. “We could conclude no deals so far due to the resistance built on the buyers’ side against higher levels,” said one of them, while the second producer said that they could sell only in limited amounts. “This is because buyers maintain their cautious purchases in order to avoid risks. Seeing thin buying interest, we don’t have enough confidence about further price increases,” commented a source from the second Korean producer. According to ChemOrbis, many players feel that the peak is soon to be reached and the upward momentum will eventually come to an end. Indeed, the firming trend has already lost some pace in the PP market due to the mounting resistance for the past few weeks. However, low stock levels on the part of both buyers and sellers continue to support the PP market. Whenever these supply concerns start to ease, the market is expected to find some relief. As most sellers have shifted their extra allocations to China due to better buying appetite and netbacks for more than a month, these cargoes are believed to be set to arrive in the country in December.